In 1982, in his hometown of Langbank, Saskatchewan, and with the support and assistance of his family, Loren McDougall began down the path that would become his - and his family's - life work. Starting with mostly rural auctions, hand perforated bid sheets and a talent for talking to people, Loren McDougall started an auctioneering company. Over the last 40 years, McDougall Auctioneers Ltd. has grown from a one-man operation with the support of his family, to a multimillion dollar business that touches every member of the McDougall family. Today, McDougall Auctioneers Ltd. is a recognized leader and innovator in the field of auctioneering, real estate and agriculture. Loren credits his ability to talk to people, his priority of choosing family before all else and an accessible leadership style for his successes. Loren chooses his team based on initiative and ability. He develops relationships with care. He empowers his team through delegated management and trusts that each person will deliver on - even exceed - McDougall Auctioneers' customer promises. The shift away from conventional to online auctions gave Loren a chance to expand their customer base through the western provinces and into the online world. Loren's challenge to his team was to adapt to and overcome obstacles and achieve new goals. Today, Loren enjoys the work as the President of McDougall Auctioneers Ltd. and time spent with his family both at the office and at home. His challenge to his team is to keep the focus on people in a growing online world. Terry is an owner and partner in McDougall Auctioneers Ltd., and heads up the Saskatoon branch. He and Loren, together with their parents, saw McDougall Auctioneers Ltd. go from an idea to Saskatchewan's acknowledged leader in online auctions. With a background in accounting, Terry is the numbers to Loren's ideas. Terry is the senior salesperson of the northern half of Saskatchewan and also general manages the Saskatoon office, having handed the day-to-day accounting to the team in Regina. Terry is keen to open new markets and create new clients relationships for McDougall Auctions Ltd. and he projects continued success and future growth within the industry. Terry share's Peta's love of travel and learning and makes travel a priority for their family. As the VP of Sales and Marketing, Riley is the personality of McDougall Auctioneers. Riley is personable and people-focused. He began working at the company in 2010 and has spent time in all the many positions and worked his way up to his current portfolio. He spends his days focused on acquisitions and business expansion. He achieved his Certified Personal Property Appraisers certificate and helped to steer McDougall Auctioneers through the transition from conventional to online auctions. Growing up in Vancouver, as part of a big family, Riley had exposure at an early age to what is means to be part of a business-oriented crew. Riley pursued a crane operator's certificate and worked in construction before moving to Saskatchewan and joining McDougall Auctioneers. He spends his off work hours with his own family. Riley is also a son-in-law in the McDougall family. As the Yard Manager of the Regina branch of McDougall Auctioneers, Ben is responsible for the daily maintenance of the outdoor spaces and items on auction. As the key person charged with the accuracy of item condition reports, Ben spend his days inspecting, testing and researching consignments that make their way to the McDougall team. With a professional background in plumbing and heating, Ben's manual aptitude lends itself to investigating a large variety of consignments ranging from industrial to commercial to agricultural equipment. His attention to detail means that clients on both the purchasing and consignment ends are guaranteed full disclosure and reliable appraisals. Ben is originally from Toronto and is a son-in-law in the McDougall family. Chad has recently joined us from Ontario & brings with him a wealth of experience acquired through Asset Management & Liquidation, Rental Liaison, and Outdoor Commercial Property expansion over the last 10 years. Chad (who is fluent in French) is already putting his performance management and organizational skills to good use and is the perfect fit for our progressive sales team. Understanding our clients' specific sales needs is key, allowing him to market both challenging and small projects with a creative and efficient flare: Innovative sales strategies and customer service are his priority! Dan's position as Sales Manager puts to good use his personal initiative and intrinsic ability to set folks at ease. Always with a focus on the customer at both the sale and purchasing end, Dan's personality and way with words turns business into a conversation. His flexibility means that Dan can be found in the warehouse, in the yard and on the phone helping customers to place their bids online, answer questions and build McDougall's reputation as a company with customers at heart. Dan joined the team as the Sales Manager from a background as a freelance contractor and office furniture specialist. As McDougall Auctioneers continued to grow, Dan saw opportunity with the company as a recognized leader in both customer service in online auctions. Dan makes his home with his family in Indian Head. As the Chief Financial Officer for McDougall Auctioneers Ltd., Elena manages the financial teams in both Regina and Saskatoon while working remotely from Florida. Elena comes to McDougall Auctioneers Ltd. from Ireland where she took her ACCA accounting training (CPA equivalent in Canada), compeled taxation designation from Irish Taxation Institute and BSc (hons) in applied accounting. Elena has been with McDougall through their transition from conventional to online auction and she is credited with many of the financial systems - including a new software system - that keep McDougall Auctioneers running smoothly and their customer numbers growing. Her goals for the company are to improve dataflow while building on further automation and efficiency. Family, health, and self-development are her chief interests. Eric is the head of the Agriculture Division of McDougall Auctioneers Ltd. and as such he brings together rural clients and the sales force of the McDougall Auctioneers crew. He is charged with growing sales for farm auction clients and property auctions in rural areas. With his own considerable background in agriculture, Eric is perfectly suited to guide the process of farm auctions for clients to gain prime sales figures. Eric has more than 20 years of experience as an Auctioneer and as a business owner firmly rooted in the farming industry. He earned his Auctioneer's certificate from the Western College of Auctioneering. Eric enjoys staying active and makes sport and outdoor time a priority. Inside the warehouse at McDougall Auctioneers, Jamie oversees the lotting of items and estimates value for online bids. His skills extend to organizing and accounting of an ever changing and variable number and type of items. He uses his skills acquired from a background in accounting to build in advance planning for efficiency. He is also responsible to itemize and give detailed condition reports to benefit both the consignor and the buyer. Jamie's face-to-face customer interaction builds McDougall Auctioneers' reputation of customer focus; his goal is to optimize the customer experience by working towards a showroom-style warehouse and an efficient model of business for increased traffic. Jamie is originally from Toronto and made his way to Saskatchewan specifically to join the McDougall team. Jay's considerable background in the construction industry gives him skills to manage the yard as a well-run job site. He ensures peak sales while maintaining customer focus. Jay's friendly style makes business a conversation between friends. Jay achieved his Auctioneer's certificate and is also a Certified Personal Property Appraisers. He is a transplant from Toronto and also a son-in-law in the McDougall family. He spends his off hours enjoying time with his family. Kristie works as the Advertising Manager remotely from an office located in Belledune, NB where she manages both the Regina and Saskatoon offices' advertising schedules while also keeping the office running and overseeing two other employees - Kim and Kyle. She is also responsible for designing and producing all the marketing materials for the company including pamphlets, posters, signage and radio promotion. Kristie joined the McDougall Auctioneers team after working in the newspaper industry. 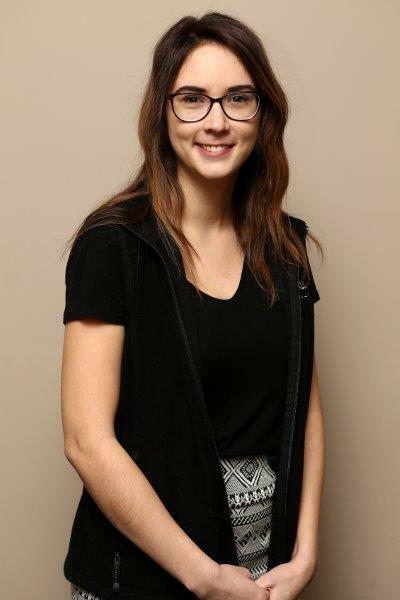 She has a background in graphic design acquired from NBCC Woodstock in her home province of New Brunswick. Her goals for McDougall Auctioneers include moving the online market to the Maritimes and broadening the customer base. Kristie enjoys being outdoors and four-wheeling with her family and friends. Peta is the chief organizer and scheduler behind her and Terry McDougall's team at the Saskatoon branch of McDougall Auctioneers. She lends her expertise and knowledge of the company to reporting, appraisals and follow up sales calls. Peta also assists in promotions, events and advertising for McDougall. Her general administration background makes her a pillar of the Saskatoon office. She has worked for the company for more than 20 years and is a shareholder in McDougall Auctioneers Ltd.
She arrived in Canada from Great Britain in 1984. Family time is a priority for the entire McDougall family. Peta spends hers reading, travelling and investing in her health. Tanya is also embedded in developing new processes for the real estate division, and creating consistency to augment sales and build stability in the day-to-day financials of McDougall Auctioneers. Tanya enjoys the outdoors and family time spent at the lake. Aaron is responsible for the daily supervision and management of the compound site in Saskatoon as well as heading up a team who assist customers to get their new purchases on the road and off to their new owners. Aaron's professional background in carpentry, his own mechanical abilities and his management experience give him an advantage in the compound yard. He is also responsible for condition reports of items for auction. Aaron has an aptitude for mechanics and hands-on projects that he continually puts to use as both a member of the McDougall Auctioneers team, and as a returning customer. He is a transplant from Ontario who has spent most of his life in Saskatchewan. Aaron's own projects often come from the McDougall Auctioneers' lots; his spare time is spent fixing vehicles and pursuing his next project.